Children in Haiti are discovering new ways to play – and to learn – with the introduction of an innovative playground, as Thomas Nybo reports in this article for UNICEF. 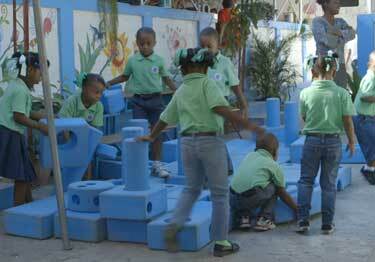 Across Haiti, students at 10 select schools are getting a chance to test an unusual kind of playground that encourages them to build forts, cars, towers and anything else that stimulates their young minds. The portable playground consists of a collection of blue foam blocks in a multitude of sizes and shapes: square, rectangular, curved, straight. They can be joined with cylindrical foam connectors and made into any number of creations – exercise equipment, buildings, ships or airplanes, to name a few. When not in use, the blocks are stored in a weatherproof metal container with built-in wheels for easy transport. The project is a joint initiative between UNICEF and The Walt Disney Company intended to encourage child-directed, unstructured play, particularly in environments of extreme poverty or disaster recovery. Haiti is one of two pilot locations (along with Bangladesh) evaluating the playground to determine its suitability for expansion to other countries. So far, the playground is receiving top marks, and according to teachers, some students, like a young boy named Bradley, are showing improved classroom behavior. At a kindergarten in Port-au-Prince, teacher Marie Michel Pierre says students have been taught that the playground is a reward. Work hard in the classroom, they’re told, and they can play hard at the playground, twice a week. High in the mountains above Port-au-Prince, another portable playground has provided a needed boost in morale. The local school was destroyed in the earthquake, and when funds to rebuild it dried up, the community grew increasingly disappointed. Today, the campus remains filled with uncompleted buildings, but students like Joanne have embraced the new playground. As these children show, the portable playground is an affordable, creative way to engage young minds outside the classroom, and inside too. And it’s fun.